If communication between the electronic key and vehicle is interrupted or the electronic key cannot be used because the battery is depleted, the smart key system and wireless remote control cannot be used. 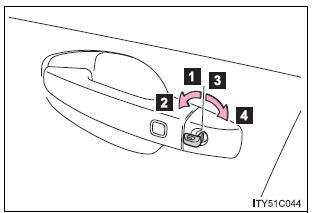 In such cases, the doors can be opened or the engine can be started by following the procedure below. Unlocks all doors Turning the key rearward unlocks the driver’s door. Turning the key once again unlocks the other doors. Shift the shift lever to “P” and apply the brakes. 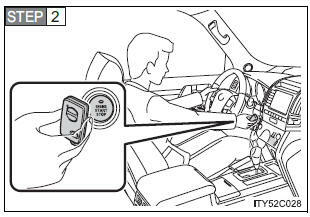 Press the “ENGINE START STOP” switch within 10 seconds after the buzzer sounds, keeping the brake pedal depressed. If a door is unlocked using the mechanical key when the alarm system is set, the alarm may be triggered. Within 10 seconds of the buzzer sounding, release the brake pedal and press the “ENGINE START STOP” switch. Modes can be changed each time the switch is pressed.